If you gave President Barack Obama a grade for his impact on the African American community what would you give him? Uptown Magazine has highlighted some of the noteworthy moments during the President’s 1st and 2nd term where he has made his stance on race clear. 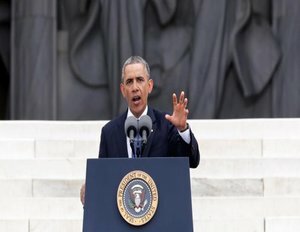 The author weighs in on the President’s reaction to Reverend Jeremiah Wright, the arrest of Henry Louis Gates, Jr., and the shooting death of Trayvon Martin. Although the story is still unfolding, so far, the results of Obama on race are mixed. At times, Obama has been bold in tackling questions of race. Too often he has been timid. I see his short tenure on the world stage as something of a three-act play.Â The First Act was his response to the Reverend Jeremiah Wright scandal in 2008. The Second Act was his decision to hold a “beer summitâ€ in the wake of the unjust arrest of Harvard professor Henry Louis “Skipâ€ Gates, Jr. in 2009.Â And the Third Act is comprised of Obama’s responses to the shooting death of unarmed teenager Trayvon Martin in 2012 and the subsequent trial in 2013.